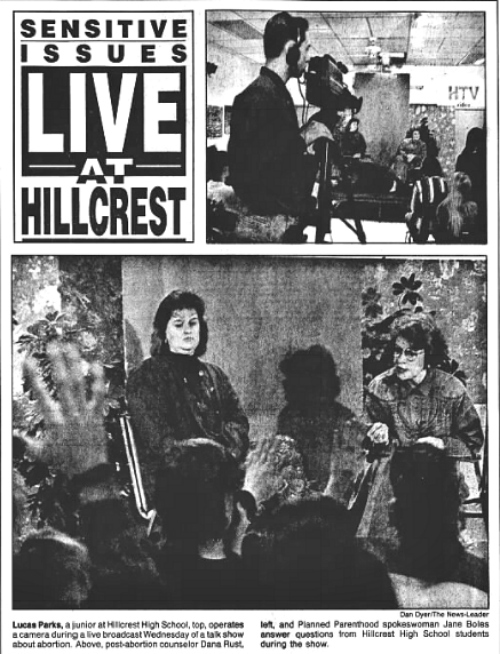 During the third year of our broadcast program at Hillcrest, I had the bright idea of breaking from our monthly newsmagazine format to try a live talk show, something issue-based. A little "Phil Donahue" (Google him, youngsters) thing, where an audience made up of teenagers could pepper our guests with questions and comments. Our first live talk show got front-page coverage from our local newspaper, the Springfield News-Leader, back in 1992. The show's topic, we decided, had to be something edgy, something that would inspire some passion. So we chose abortion. I know, I know. Just inviting trouble. It is a good thing Dr. John Laurie, our supportive principal, was really supportive. He had our guests, each representing opposing viewpoints on the issue, arrive early for a brief meeting in his office. I was there, but he did the talking. He asked them to remain professional, and avoid some of the back-and-forth "heat" the abortion topic often inspired. Both guests said they understood, and would be on their best behavior. Our set-up was just my regular classroom, with one Panasonic SVHS 450 camera sitting on a small platform in the back of the audience, right in the middle. "Camera One." The other Panasonic was perched in front of the room, off to the side of the guests, getting shots of our host, Amy Cookson, and the audience of about 30 teens as they asked questions. "Camera Two." Sitting in a small room at the back of the classroom, switching the show live, was a senior named Dan Arnall. We had a modulator carrying our signal back to Telecable, where the show went out to all the subscribers in town on the educational access channel. It was a bold project, and the local newspaper even covered it. Things went smoothly, but in the last 10 minutes, the two guests did start using some of the inflammatory rhetoric the issue of abortion often inspires. It was actually getting kind of fun...then our signal was lost for some reason. Still, we did about 35 minutes of the 45 minute broadcast we had planned. It was a victory, as far as we were concerned. Why share story now? If for no other reason, I would like to inspire you to take a chance now and then, and to step out of your comfort zone. We did, way back when. It was not our only live talk show. After this one, we did a few more, tackling the AIDs epidemic one time, race relations another, and those were before 1996. We did a live Q and A format with our local congressional candidates one year, partnering with kids from the middle school gifted program. They came over and helped run the show and question the candidates. Again, it was live. That host of our abortion show, Amy, is now the mother of one of my sophomore Broadcast I students, Madison. She is doing a great job, just like her mom did 26 years ago. Dan, the director back in 1992, is now the Executive Producer of the NBC Nightly News Weekends. While going Iive with teenagers is always risky, I think never doing anything different can sometimes lead to stagnation in your program, and that is even more risky. I urge you to do that crazy thing you've been thinking about, whether it is a totally different type of show, or tackling a really scary topic. Or do both, like we did all those years ago. It can set a tone for your program--that anything is possible--and that is a pretty cool thing for your students to realize.